You'll be £12.99 closer to your next £10.00 credit when you purchase Wittmann Vs Ekins DVD. What's this? The story of two men destined to face each other on the battlefields of Normandy is told in this programme. Michael Wittmann was a knight of the Nazi empire, a natural and accomplished soldier and highly decorated. Like Wittmann, Trooper Joe Ekins, a shoemaker from Northamptonshire, was a volunteer for military service but there the similarities ended. Joe was a reluctant soldier in a county yeomanry armoured regiment, while Wittmann served in the Waffen SS's elite Tiger Battalion. Panzer ace Wittmann had 138 tank kills to his name, including an impressive score against 7th Armoured Division at Villers Bocage early in the Normandy Campaign but by August 1944 the Allied breakout was gaining momentum and I SS Panzer Corps were struggling to contain the British and Canadians as they fought towards Falaise. In the fields south of Caen Wittmann's Tiger and Joe Ekins's Sherman Firefly were pitted against each other but how was the Panzer Ace finally knocked out? Veteran of the Battle of Normandy and the North West European Campaign, Joe Ekins fought with the Northamptonshire Yeomanry and during Operation Totalise, the British and Canadian breakout from the Normandy Beachhead, he was a gunner in a Sherman Firefly. This was the only Allied tank that could knock out the much feared, mighty German Tiger tank at anything other than the closest of ranges. During the desperate battle he knocked out three Tigers and a Panzer Mark IV. At the end of the war, preferring the anonymity of being a shoemaker in civi-street, Joe attempted to keep a low profile but over the years his achievement of knocking out the vaunted German SS panzer ace Michael Wittmann, denied him obscurity. Stung by some wilful misrepresentation of facts and his views, Joe has for the first time told his story for this DVD in full and in detail. Tim Saunders, a British Army officer for 30 years, he is now a full time military historian, with 13 titles in print. He has appeared in Time Team, Battlefield Detectives and Lost Evidence amongst other broadcasts. Tom Dormer has a true passion for military history. He regularly conducts authoritative and memorable tours of the WW1 and WW2 battlefields. Tom is a director of Battlefield History TV. Richard Hone, after 22 years in the Royal Electrical and Mechanical Engineers, has lost none of his love for military vehicles. His knowledge of armoured vehicles and the soldiers who fought in them during WW2 is encyclopaedic. He is a master of his subject, with not just the facts and figures, but he also has a soldier's insight into how weapons and vehicles actually work on the battlefield. An absorbing video that adds to the appreciation of the conditions after the first landings as the Allies fought to break through the German defenders and raced towards Germany and the end of the war. This is a fascinating and provoking programme on what remains one of the most controversial tank engagements of the twentieth century. this is the story of two completely different soldiers that were both dedicated to their countries, unfortunately those two country's weren't the same. This documentary traces the life's of Wittmann and Ekins and their career's throughout the war, with a main focus on the fighting in Normandy, and the death of Wittmann. The film consists of three presenters, two historians and a weapons expert whom narrate the tale of these two extraordinary stories. Also we can get Ekins side of the story as he tells all about war life and training to battle. Michael Wittman was one of the best known German tank aces of the Second World War, single-handedly halting a major British offensive at Villers-Bocage. This documentary traces Wittmann's career throughout the war, focuses in particular on the fighting in Normandy. At the same time it looks at the career of Joe Ekins, a British tank gunner who many have fired the shots that killed Wittman. The basic format of the film consists of three presenters - two historians and a weapons expert - narrating the two stories. 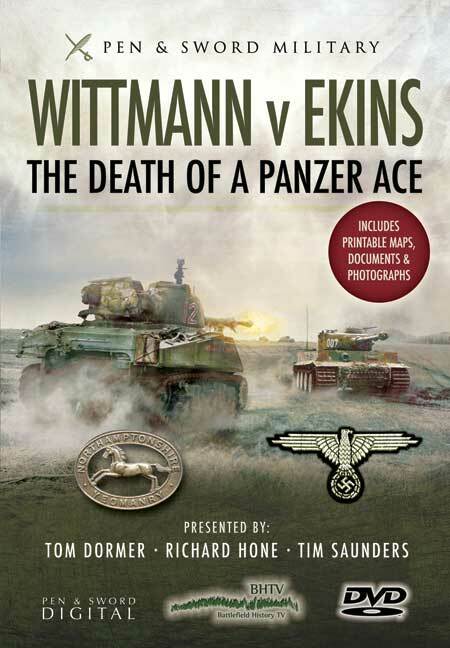 This is supported by a fascinating interview with Ekins, and by some directly relevant wartime photos (including pictures of two of Wittmann's knocked out tanks. The disc contains two episodes. Part One looks at the two men's background, Wittmann's wartime experiences, Ekin's training, the Tiger vs the Sherman Firefly and the campaign from D-Day to Viller-Bocage and the start of the Allied breakout. Part Two looks at Operation Totalize, the battle in which Wittmann was killed. This film demonstrates the importance of position, surprise and luck in tank warfare. At Villers-Bocage Wittmann had the advantage of surprise and was lucky, driving past a hidden British tank at short range but while the gunner was absent! During his final battle Wittmann was in a bad position, advancing across open ground towards one formation of British tanks and with British and Canadian tanks on both sides. This is where Ekins comes into the picture. As the Germans advanced across his front he hit three Tigers with five shots in 12 minutes. All three were knocked out, probably including Wittmann's tank. The film finishes by looking at the various claims to have destroyed Wittmann's tank, concluding that Ekins had the best claim. This is the second DVD I have had the pleasure of reviewing from the partnership of Battlefield History TV and Pen and Sword Digital. While the first DVD I reviewed focussed very much on family military history, this release looks at two very different men, on opposing sides of one of the most famous battles of the Second World War. Michael Wittman was the most renowned German Tank Ace of the Second World War. By the time he arrived in Normandy with his elite Waffen SS Tank Battlion, he had seen extensive service on the Eastern Front and had been decorated for bravery. By contrast Trooper Joe Ekins was a shoemaker in civilian life who had volunteered for the Northamptonshire Yeomanry, a territorial armoured unit. These two very different men came to be facing each other in August 1944 during Operation Totalize - Montgomery's attempt to break out of the bridgehead or tie down German reinforcements, depending on which side of the historiography you sit! Many books and programmes have attempted to pinpoint exactly who killed Michael Wittman. Where I think this DVD is spot on is in its conclusion that while it is almost impossible to pinpoint who exactly who killed Wittman, but it is very possible that it was Trooper Ekins. My take on it having watched the DVD, is why have people become so fixated with finding out who exactly killed Wittman? Lots of men and tanks were fighting each other in the summer of 1944, is it really possible or indeed wise to try and isolate individuals from the bigger picture? But I guess if people are interested in it, its always going to be the subject of speculation. I found this a very enjoyable DVD indeed. The balance between battlefield visits, the interviews with Joe Ekins and the expert analysis as just about right. In particular I enjoyed Richard Hone's look at the German and Allied tanks. The use of battlefield maps, overlaid with graphics and used in conjunction with battlefield views, really brings the story to life. But best of all, the interviews with Trooper Joe Ekins ensure that his memories and experiences are recorded for posterity. This kind of focused, battlefield interpretation lends itself very well to the DVD format. Its very well produced, and with a nice soundtrack. Whereas Tracing Great War Ancestors was a good effort, this seems a more confident offering. The ability to talk to veterans, walk the battlefields and present graphics paints a picture far more accessible than even the most vivid book. And I think there is a demand for these kinds of studies. I can think of plenty of stories associated with Arnhem that could be told very lucidly using this approach - fingers crossed we will see many more like this in the future.